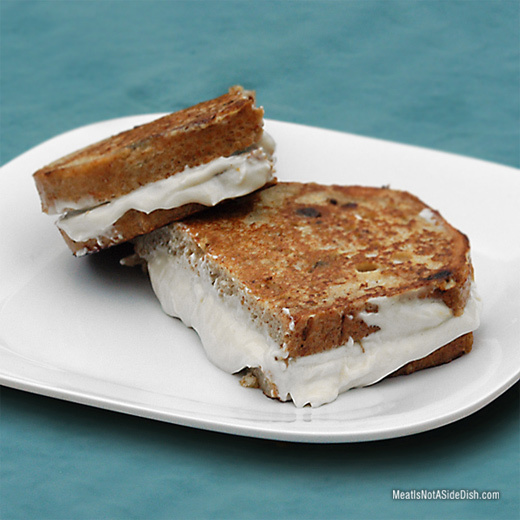 To make Stuffed Raisin Bread French Toast, beat together eggs, milk, salt, cinnamon and vanilla. In a separate bowl, heat honey in microwave for ~10 seconds then combine with melted butter. Whisk butter mixture slowly into the egg mixture until combined. Heat flat griddle. In a separate bowl, combine filling ingredients until uniform. Dip first piece of bread into the egg mixture and place on griddle. Spoon filling mixture onto bread and spread until 1/2 thick. Dip second piece of toast into egg mixture and add to stack on griddle, egg side out. Cook on heated griddle until each side is browned. Repeat with remaining sliced of bread. Serve with syrup or plain.